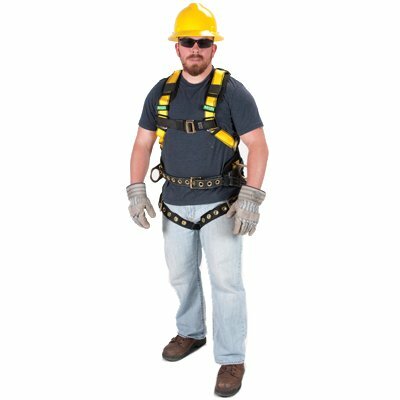 Harnesses are typically used in conjunction with other fall protection equipment like lanyards. When combined, these equipment constitute what the OSHA refers to as a fall arrest system. As its name implies, fall arrest equipment effectively protect your workers from grave injuries from falls by actually arresting falls. Harnesses feature a front D-ring are typically rated to 400lbs capacity. Complete fall arrest systems are, however rated for 5,000lbs. 1. Check the belts of the harness by bending the belts into an inverted U shape and check for fraying, pulled stitches, cuts, or chemical damage. 2. Check D-rings and D-ring metal wear pads for distortion, cracks, breaks, and rough or sharp edges. 3. Check the buckle attachments of unusual wear, cuts, frays, or distortion. Rivets should be tight and can't be removed with your fingers or bent. 4. Buckle tongues and friction buckles shouldn't be distorted or have sharp edges. Buckle tongues should overlap the buckle frame and move freely back and forth. Friction buckles' outer or center bars should be straight. If your harness shows signs of these or other damage, these shouldn't be used and should be replaced immediately.